Located in Tomlinson Run state park. 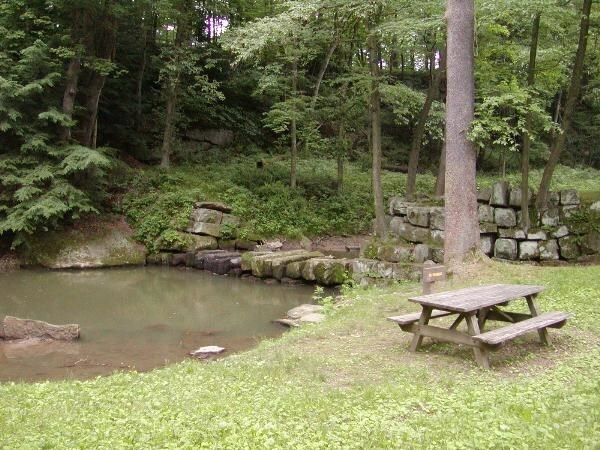 Mineral Springs is the best kept secret of this beautiful park and most people do not know it is there. My grandparents owned this property for many years before it was sold to the state of WV. Please take the time to walk around a bit and enjoy the peace and serenity of this area. Mineral Springs has a very rich and interesting history. You will see a small fenced in area about 8 feet square that is the location of the origional spring. My grandfather used to bottle this water and sell it for medicinal purposes. There were all kind of claims for the benefits of drinking this water. More information and pictures can be seen at www.gristmills.tripod.com, then click on mineral springs. Parking coordinates are 40 32.360 and 080 34.410. That is at the swimming pool parking lot. The trailhead is at 40 32.434 and 080 34.489. I suggest you begin your search there. You will be looking for a camouflaged small lock and lock. I truly hope you like this area as much as I do. Bring a picnik lunch or a fishing pole if you care to. Gur ehfgl cvcr cbvagf gb gur gernfher.